9,000 miles. 19 countries. 9 days. 1 amazing HP cartridge. As always, the test needed a direct link to the real world conditions that could be experienced by HP tape cartridges. One of the key benefits of HP StoreEver tape is that it allows you to move and protect data offsite. But whether your data originates on an oilrig, a film set or in a state-of-the-art data center, it needs to arrive safely. 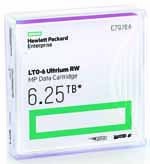 This is why HP tests its LTO data cartridges for shock and vibration beyond the ordinary requirements of the industry standard. And how better to measure shock resistance than to attach an HP LTO-6 data cartridge to the roof of a VW Touareg, hurtling across Europe and Africa in a race against time, battling through all terrains and conditions on its record-breaking mission? No special padding was used to protect the cartridge from the rigours of the journey other than to wrap it in waterproof tape purchased from a household DIY store. Otherwise, the HP cartridge travelled in its own original shrink wrap. The same DIY tape was also used to secure the cartridge to the roof of the car. This was to ensure that the data cartridge would feel every bump and jolt and be exposed to the same changes in external temperature and humidity as the vehicle. With altitudes ranging from sea level to heights in excess of 9,000 feet, the cartridge experienced an enormous range of temperatures and humidity, a real-world version of environmental interchange tests deployed in HP's laboratories. At times, humidity levels reached 90%, and temperatures switched from below 10°C to above 40°C, all within a matter of days. 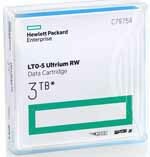 At the end of the trip, which was 21 days, 19 countries and 9,000 miles later, the HP LTO-6 cartridge still worked flawlessly when it came back for testing at HP's media laboratory in Bristol. No deterioration of error rate, capacity or transfer speed was observed.